Evolvepreneur - Helping Entrepreneurs Make a Difference! What If People Would Actually Pay You For Your Advice? I have a short story for you... About 2 years ago I bought a book called Dotcom Secrets from Russell Brunson. 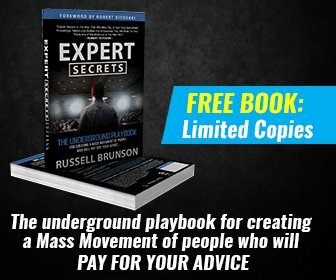 Get Your FREE Copy Of EXPERT SECRETS Now... I just got my actual copy (because I had a preview copy before). What he also gives away totally free is a 5 part video training which alone is worth hundreds if not thousands of dollars alone. All you do is pay a small amount for the shipping which is fair enough. But don't take too long because there is only 19,000 copies in the first shipment and they have sold obver 18,500 in the past few days. After that, you will need to wait 60 days for the next shipment or buy it on Amazon for the actual price.